Curious how The Colonnade might work for your ceremony and reception? 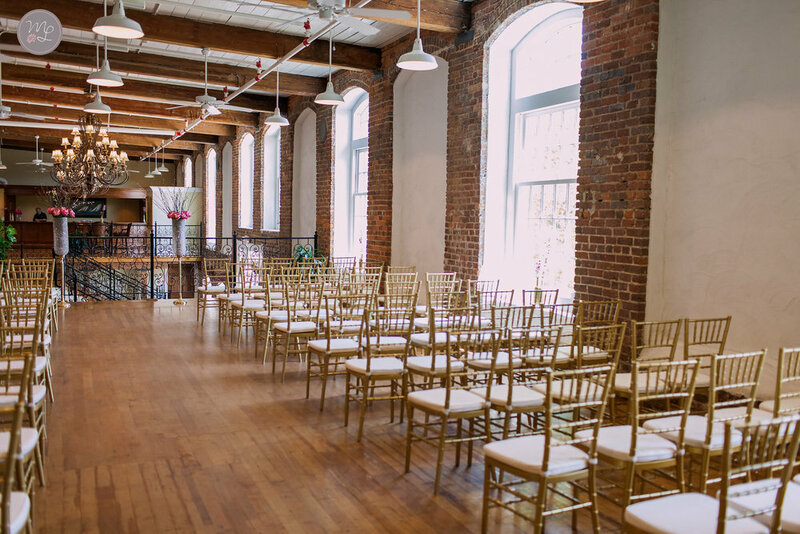 Our space is extremely flexible and we’re always happy to work together to customize the space, but there’s a few tried and true setups we’ve found work well for weddings of all sizes. Part of our expertise is knowing what will and won’t work for our space. We host well over 100 events a year, so we can help ensure that your creative ideas turn out to be a success! We’ve put together 3 graphics to help you visualize where your ceremony, dance floor, food, gifts, and cake can go in our space. To start, we suggest picking a dance floor location and building the rest of your layout from there. We have 3 popular options for dance floor placement. Tables can be placed around the dance floor in Option 1, allowing all your guests to watch as your family busts a move. Some couples enjoy how the dance floor is separate from the dining tables in Option 2, which is conducive to conversation for the non-dancers. Of these three options, Option 3 allows for the most seating capacity, making room for tables across the main level to seat up to 200. Keep in mind – we don’t lay down a separate dance floor, because our historic hardwoods work great as-is! Once you pick your dance floor spot, we’ll determine where the DJ and band setup should go. Before we nail down the rest of your reception details, we’ll want to figure out where your vows will take place. A courtyard ceremony is a popular option – depending on the season – and can seat up to 180 guests. Option 2 provides a wonderful decorating opportunity for a customized floral arch or drapery backdrop. This option can seat up to 130. 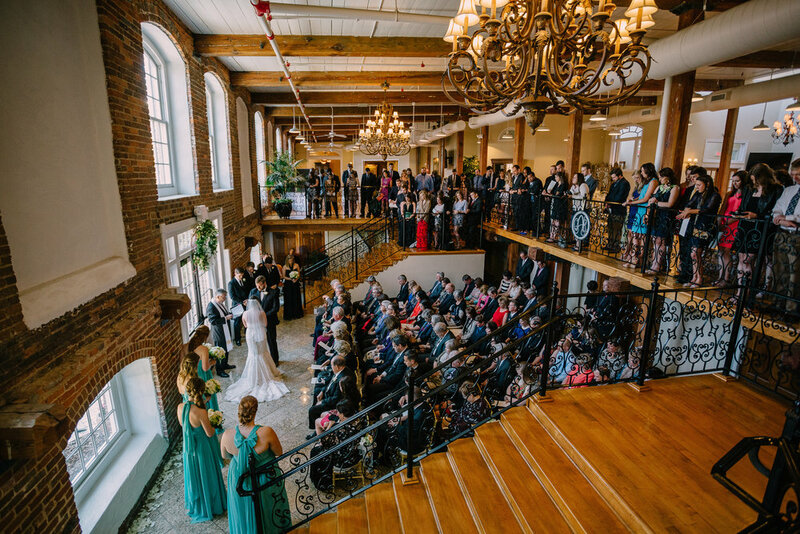 Option 3 offers great flexibility -- 72 guests can be seated on the lower level while additional guests can stand around the railing, giving them a great view of the ceremony. This setup highlights the textured brick and expansive windows for stellar photos. Depending on guest count, we can use Option 2 or 3 for an inclement weather plan. Now that you have the two big decisions locked in, its time to determine the flow of guests and the placement of your food, gifts, and cake. While some folks opt for guests to arrive through the courtyard, most people utilize The Colonnade’s main entrance for guest arrival. Guests can set presents down on Gift Table Option 1 or 2 (as pictured below) as they arrive. You can also place a guest book table in the entryway or near the coat closet for easy access. Our main buffet area gives Pepper Moon Catering staff easy access to the kitchen and allows for guests to freely flow on both sides of the table, cutting down on serving time. Additional interactive food stations could be placed around the room to encrouage guests to mingle. Your cake can be highlighted in various locations. No matter what your vision, we belive we can make The Colonnade work for your wedding! You bring the ideas and we’ll bring our knowledge of past events. Together, we’ll create the perfect ceremony and reception for you and your guests.